BeJae Fleming (Loquantur RHYTHM January 23-29, 2017) | Loquantur, Inc.
Bluesy grooves, folk vibe, beautiful melodies, lyrical sounds with a down home rock and roll edge – hold music never sounded better. LoquanturRHYTHM partners with another breakout artist full of energy and originality, BeJae (pronounced B.J.) Fleming. Her music is passionate, full of innovative acoustic guitar riffs and engaging storytelling. BeJae’s lyrics and soulful melodies bring you on a journey through the heartland. 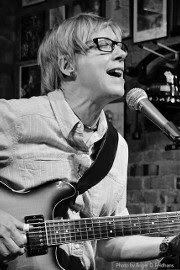 True to her North Carolina roots, her music ranges from gentle to gritty, celebrating life’s tribulations and triumphs told through heartfelt imagery as well as with a witty sense of humor. More than a folksinger, her Americana blues sound has entertained audiences from East Coast coffeehouses to Las Vegas convention centers. BeJae developed her songwriting and musical crafts performing in Texas and playing standout club scenes in Austin and Dallas. Her audience is diverse yet unified in the appreciation of well-crafted and well-written music. She is joined by Jackie Blount on electric bass who has contributed to Fleming’s unique sound since the 90’s. She has been influential in the creation of the Americana “Iowa sound” along with labelmates Greg Brown, Pieta Brown, Bo Ramsey, David Zollo, Joe Price, Brother Trucker, Patrick Bloom and others. Listening to BeJae Fleming’s smokey-voiced blues touches the soul leaving the listener yearning for more.